The shape: The two top horizontal curves depict two bomb craters. The vertical curves culminate at the bottom to show unity. Background colours. Navy, red and sky blue represent the security forces on sea, land and air where most of Crater Shellholes’ members served. CRATER Founded in 1928 by ex WWI soldiers. Crater referring to the cavity left after a bomb explosion. Mine Safety Lamp. Illustrates the strong bond with the coal mine industry since 1928 when the Shellhole was started at S.A. Coal Estates to presently where most of the members are still rooted around the coal mining industry. The burning light inside the lamp portrays remembrance. Cosmos flowers. represents the geographical location namely Mpumalanga Central, the “cosmos district” In nature pink cosmos forms 60% of the flowers, the rest white with the odd magenta colour. Crater Shellhole was founded in 1928, less than a year after the establishment of the Order. 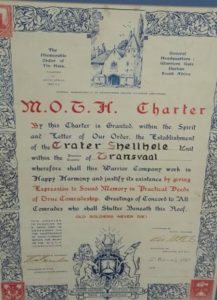 The Crater Charter sports the signature of Moth “O” (Eveden) as “Founder Member” against the Charter date of 3 February, 1928, being the second oldest surviving Shellhole in the Platinum Province (Transvaal) The name Crater was deducted from the word crater meaning a “large bowl-shaped cavity in the ground caused by an bomb-explosion impact” with particular reference to first-hand experience by the Crater Shellhole Founder Members during WWI. Please see the photo of the earlier Crater Logo designed by those members. 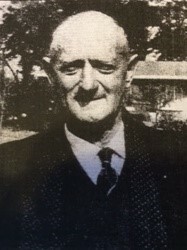 Although the Shellhole struggled to survive in the late thirties and particularly during WWII, when it was down to a mere 4 members, Crater Shellhole through the faithful endeavors of a few Moths namely Alec Buchan, Alf Bowker, Andy Souter, Jack Small, Gordon Harley, Jack Boddy, Willie Boles Fred Trivett and Bill Penman, avoided having to hand in their coveted and treasured Charter. Crater Shellhole, through the years, formed the pivot around which other Coalfields District Units was founded, re-opened and in many cases sadly closed. Crater Shellhole ran the first MOTH Magazine “The Tin Hat” which later become the “Home Front” which was then the official MOTH Magazine. The nominal role of Crater Shellhole shows 24 members presently and also have 6 “Friend of the MOTH” members. Two MOTH Bowls days in June and December. This year’s event will be on the Saturday 3rd December, 2016 at 09:00 at Witbank Golf Bowls Club. Poppy day street collections, closest Saturday to 11/11. The proceeds of the fund raising events are usually allocated to the MOTH Sound Memory Cottages in Witbank.